Fasting [உண்ணாநோன்பு/உண்ணா விரதம்]:A lot of our time and energy is spent in procuring food items, preparing, cooking,eating and digesting food. Certain food types make our minds dull and agitated. Hence on certain days man decides to save time and conserve his energy by eating either simple,light food or totally abstaining from eating so that his mind becomes alert and pure. Since it is a self-imposed form of discipline it is usually adhered to with joy.Also every system needs a break and an overhaul to work at its best. Rest and a change of diet during fasting is very good for the digestive system and the entire body. The more you indulge the senses, the more they make their demands. Fasting helps us to cultivate control over our senses, sublimate our desires and guide our minds to be poised and at peace. The act of putting water around the plate :The act of putting water around the plate in which we have food and to keep some part of what is served in the plate outside the plate on the ground while you sit on the floor to have dinner/lunch. As we know water acts as a repellent to many tiny creatures that roam on the floor seen and unseen, hence the circle of water stops them to approach the plate when kept on the floor also they are attracted towards the part of food kept outside the plate making it safe to consume the food. 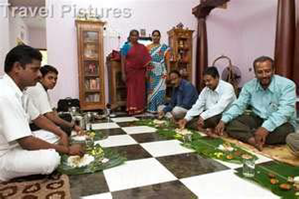 This practice is redundant while eating on dining table which is presumable cleaner than the floor. Those who still practice it on table are just following tradition without knowing the meaning behind it. Why is it necessary to wear earrings etc? :In olden times,women used to sit at home doing household chores while men used to go out on field work( which involved lots of muscle work). By sitting at home with doing not much physical work, blood pressure tends to increase and as a result, develops impatience. In order to put this in control ,women were asked to bind their wrists,stomach, ankles and arms. Thus constituted bangles,waist belt,anklets,armlets into our culture. After some hundreds of years, wearing these became a part & parcel of woman! We have nerve branches from all the body at the tip of the ears. and earrings are worn to keep these nerves activated. They say that to check if all organs work fine for a new born baby, they generally pull its ear and if the baby cries out loud, it really is healthy.The bangles or ‘kaappu’ are worn in hands and it continuously applies pressure on the point on the wrist and also,bangles cause constant friction with the wrist which increases the blood circulation level.similarly the ‘anklets’ in legs,chain in neck.The spot between the eyebrows on a forehead is considered a major nerve point in the human body. A ‘Pottu’[bindi/tilak] is believed to prevent the loss of energy, and retain this to control various levels of concentration. Moreover, the act of applying this ensures that the points on the mid-brow region and Adnya-chakra are pressed, facilitating blood supply to the facial muscles. Now all these pressure points are the points which when pressed increases fertility both in men and women. These pressure points are used in Acupressure therapy these days to treat fertility related problems in the entire world.Most of these ornaments are used by Indian women after marriage and the sole purpose of the establishment of marriage institution was child birth and survival of the human race. Probably this was the reason our ancestors associated these ornaments with high dignity and made people feel it to be auspicious, pious and Godly. This tradition of ours is only symbolic mark of a rich tradition now and has lost its significance in today’s world of fashion and the mad race of looking beautiful by compromising on its health benefits. "Thoppukaranam"Why did we get this punishment? :Remember the ‘good’ old school punishments? Holding the earlobes with arms crossed over your chests, bending the knees and then sit and then stand and so on. If you still cannot figure out the punishment just see the picture attached.I hope now you remember. Talking about the logic behind this punishment, it is very interesting to know that this particular posture increases the blood flow in the memory cells in brain and synchronizes the right and left side of the brain to improve function and promote calmness, stimulates neural pathways via acupressure points in the earlobe, sharpens intelligence and also helps those with autism, asperger’s syndrome, learning difficulties and behavioral problems. Why does "wedding" Prohibit during July- August[month of Aadi[ஆடி] ]? :The monsoon months are the weakest months of the year, easily causing diseases due to change in the climate because of the pouring rains. Monsoon is strong during these days spreading diseases through water and air.That is why marriages, family celebrations and other communal activities are not held during this month.These practices link the people to the age old sentiments and customs that have passed on to our modern generations traditionally. According to traditions this month is inauspicious.The real meaning behind this has many scientific implications. If the bride conceives in this month, she will deliver the child in the second half of May (Chithirai), the hottest period of the year, which may harm both the child and the mother. Moreover, contagious diseases like small pox, measles, etc. are more prevalent during this time.Another practical reason is that this season is the time for busy agricultural tasks of cultivation. All people have to focus their whole attention to agriculture, Rivers and streams are filled with water due to monsoon rains and men cannot waste their time in other engagements. They have to get up very early in the morning and involve themselves in their duties. 'எழுத்தின் கதை அல்லது வரலாற்றை' அறிவோமா? Do we know 'The Story or History of writing'? எந்த நாடு போனாலும் தமிழன் ஊர் வேலூர் போலாகுமா?